A Florida hunters reportedly killed a 15-foot, 800-pound alligator that was thought to be feasting on the farm's cattle. A pair of Florida hunters killed a 15-foot, 800-pound alligator that’s so massive the photos of it have gone viral. Lee Lightsey, owner of Outwest Farms in Okeechobee, Florida, and hunting guide Blake Godwin discovered the alligator in one of their cattle ponds while guiding a hunt, Fox News reported. They believed the gator had been feasting on cattle. “We also discovered the remains that we determined to be cattle in the water. We determined that he was in fact attacking our livestock as they came to drink,” Godwin told Fox13. According to Fox 13, the pair spotted the alligator from about 20 feet away and Lightsey shot it. 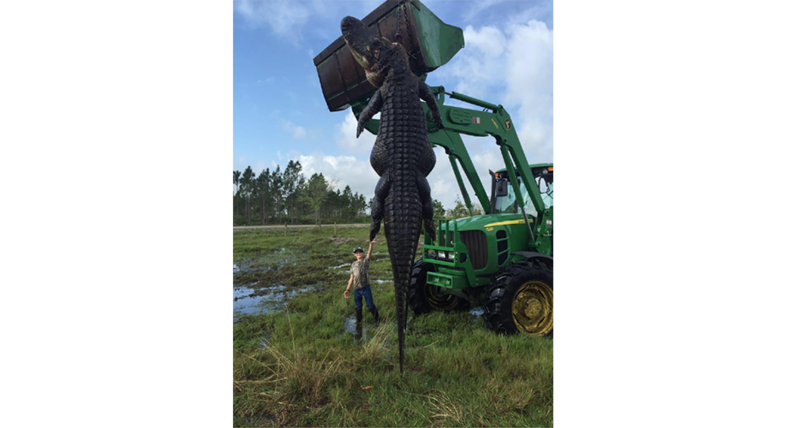 A picture of the 15-foot gator hanging from a tractor was posted on the Outwest Farms Facebook page and quickly started making rounds before being picked up by numerous media outlets, ultimately going nationwide. Outwest Farms specializes in year-around hog and alligator hunting, according to its Facebook page. It also offers Axis deer hunts and Asian Water Buffalo hunts.